I didn't read blogs very much before I started my own, with the exception of political blogs. I didn't know there was such a generous online community of creative people until I started poking around, looking for links for my blogroll and reading the blogs of those who left comments. It's been amazing because for years I wished I had the kind of encouragement for pursuing my creative yearnings that is widely-found on these blogs. Now that I've found it, something in me has been ignited and those chattering, negative voices in my head that get all uppity when I write or craft are fading away. Thank goodness. Have you ever come across a few words or a sentence that is so powerful that it stops you in your tracks and you have to read it again and again? 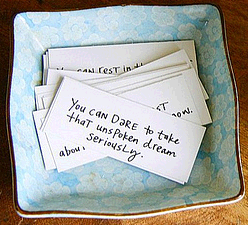 I came across a sentence like that in this photo from a post on Kelly Rae Robert's blog. I saw it for the first time on Friday, and I kept going back to the blog post to read it again and again that day. Then I made the photo my computer background. Then I wrote the sentence on a piece of paper and put it in my purse. I kept looking at it all weekend. I found more words like that while reading Elizabeth Gilbert's "Some Thoughts on Writing" on her website. She writes, "I believe that – if you are serious about a life of writing, or indeed about any creative form of expression – that you should take on this work like a holy calling. I became a writer the way other people become monks or nuns. I made a vow to writing, very young. I became Bride-of-Writing. I was writing’s most devotional handmaiden. I built my entire life around writing." I can't get that passage out of my head (not that I want to). I didn't know you could marry writing, and now that I do, I'm thinking of proposing. 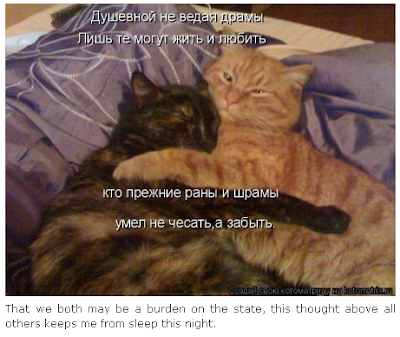 If you are a Lolcat fan, you might enjoy the Russian version, Rolcats, English Translations of Eastern Bloc Lolcats. My sister sent me the link last week-- it's so funny. What an interesting post. Lots to think about. There are many things I'd like to marry -- work isn't one of them LOL. But knitting or quilting -- such a deal. Those kitties are too cute. Maybe they are responsible for all the Russian spam I've been getting lately!